High Temperature Manufacturing Products: The best solution often includes a combination of high temperature machining solutions. Fortunately, MWI enables one-stop shopping by providing a wide variety of intense temperature and composite solutions to best fit your total requirement. Whether you need electrical discharge machining supply selection and part design, or final machined and treated products, MWI will exceed your expectations. After more than fifty years serving the industry, we guarantee it. Often the ideal solution requires a crafted combination of higher temperature carbon materials. One of the reasons MWI Inc is an industry leader in graphite machining is that we offer a huge variety of customized supplies and manufacturing products so that you can find the perfect solution to your specific needs. “TOKAREC” C/C COMPOSITE is a material comprised of extreme-strength C. fiber and C. matrix. This composite, having excellent mechanical properties, is suitable for use in a variety of high-temp applications where extreme strength is desirable. MWI manufactures c. insulation components for thermal gradient control and energy efficient solutions. We also provide C. insulation solutions to reduce hot zone particle contamination. MWI Inc is excited to offer glassy carbon supplies! Through years of intense research and innovative development, we’ve perfected our process to produce these premium products. These products are ideal for plasma etch and ion implantation, as well as other environments that require extremely pure components. In theory, this substance should act just like graphite and other types of manufacturing substances, but in reality it doesn’t react as quickly or intensely. This is because it is extremely dense, which differs from traditional types of graphite which are more porous. This density and resistance is much more similar to HOPG and pyrolytic graphite than lower density traditional graphite. MWI is proud to be an industry leader for over 50 years. Our clients come to us when they’re looking for the highest quality manufacturing solutions. They know that our Total Quality Management Program guarantees exceptional manufacturing products and customized machining solutions. Typical Properties of Glassy C.
Contact us to learn more or to buy glassy carbon supplies online. 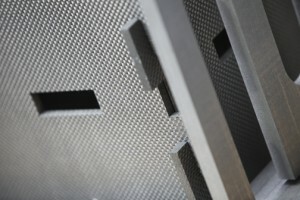 Solid SiC, manufactured by a unique Chemical Vapor Deposition process (CVD), is used in many advanced semi-conductor applications where high purity is required. Click here to buy Solid Silicon Carbide Coating online.